Keep your drink hot with Snow Queen Elsa and her trusty snowman friend, Olaf! This Disney Frozen Olaf and Elsa 24 oz. 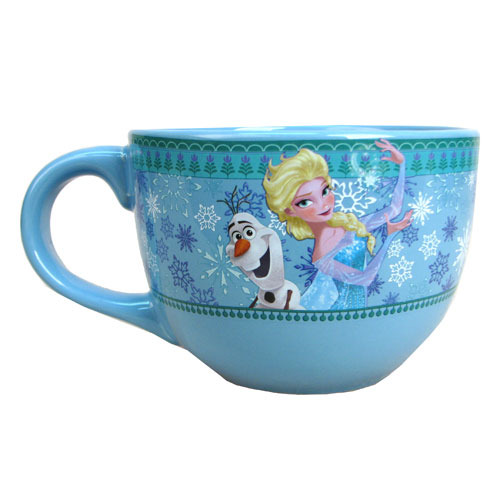 Soup Mug features an image of Elsa and Olaf on a blue background with snowflakes. This is the perfect mug for any Frozen fan! Able to hold up to 24 ounces of liquid. Hand wash only. Not dishwasher safe. Do not microwave. Measures 4-inches tall and 5-inches in diameter. Ages 14 and up. "Thank you Entertainment Earth. Absolute pleasure doing buisness. Hard to find items sent to your door. What more can be said." "Thank you Entertainment Earth. Absolute pleasure doing buisness. Hard to find items sent to your door. What more can be..."